We’ve been doing a lot of reading while waiting for spring to arrive. And watching a few shows, too—isn’t that what gloomy Sunday afternoons are for? Check out the recommendations on our radar this month, and leave your own in the comments. Enjoy! 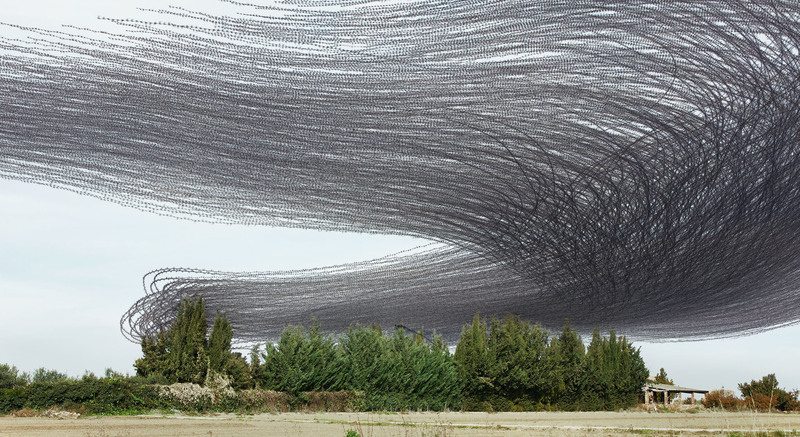 Barcelona photographer Xavi Bou wondered what it would look like if you could see the pattern a bird’s flight made in the air. By layering individual frames of video footage, Bou was able to capture these unique paths and patterns in this piece in National Geographic. The resulting images show both mayhem and order and patterns that look like snakes; roller-coaster routes; and long, flowing hair—but that’s just what I see! Several television shows have attempted to capture the magic of lip sync contests, from MTV’s Lip Service in the early ’90s to Fox Family’s Great Pretenders at the turn of the millennium. It’s a wonderfully silly premise, but the shows didn’t make it that long—and now we know why. Today’s version is called Lip Sync Battle and features the ingredients that were missing in those original game shows: celebrities and trash talking. Originally a recurring bit on The Late Show with Jimmy Fallon, Lip Sync Battle is hosted by hip hop icon LL Cool J and model Chrissy Tiegen, who both watch and cheer alongside a live audience as two celebrities take the stage and pretend to sing along to their favorite songs. There are two rounds; the first is a “stripped-down” lip sync—just the celebrity, the microphone, and stage presence. The second act is an all-out production, with costumes, back-up dancers, set design, and even cameos from the likes of Beyoncé, Jennifer Lopez, and Mary J Blige. In between, the celebrities participate in mockumentary-style interviews about how they prepared for the show and how they plan to beat down their opponent with their silent rhymes. The winner is determined by the audience, who cheer for their favorite performer. I absolutely love this show, and I recently bought the first two (partial) seasons on YouTube—which in itself is a statement, as the platform is rewriting the norms for content distribution. The first season offers many highlights, but one of the standouts is definitely the final battle between actresses Emily Blunt (who is married to the show’s producer, John Krasinski) and Anne Hathaway. In this awesomely animated comic book-style piece, OZY answers the question so many are asking: WTF is blockchain?! Deeming it the most disruptive technology since the internet, OZY goes into detail and discusses the implications in what’s definitely the most entertaining and informative blockchain article I’ve seen in—well, ever. Did you know that “in 2016, relationship scams were the second-most-costly form of internet fraud (after wire fraud), netting scammers nearly $220 million”? I didn’t. This article, by Rachel Monroe, profiles one man’s history of conning women and how he managed to make his “skills” into a lifestyle. As a woman, this piece also had significance for me because it made me question how so many different women, smart women, could be duped by the same man. What is it about the con man that allows him to tap into a person’s weak spot and exploit it so deftly? Monroe’s exploration made me want to learn more about the complex psychological profile that enables someone to dupe others on a level that goes way beyond, say, simply cheating on a significant other. If nothing else, this article will make you think twice about online dating. The second season of Donald Glover’s show Atlanta is under way and continues to live up to its reputation as one of the most refreshing and innovative shows. Using the rise of fictional rapper Paper Boi as a lens, Atlanta shines a light on characters and stories that don’t normally make it into the mainstream. It also skewers many pop culture trends—the acoustic rendition of Paper Boi’s current hit by a drug dealer’s girlfriend in episode 2 is an early highlight. Although Atlanta is billed as a comedy and has some big laughs, it’s the unique worldview that sticks with you long after watching each episode. Alia is the director of accounts and strategy at Leff. Her expertise is in creative strategy and operations, weaving together the efforts of writers, designers, video producers, analysts, and subject matter experts to produce meaningful work.